The 14th Meeting of Foreign Ministers of the Western Mediterranean Forum, commonly referred to as 5+5 Dialogue, commended the role played by Al Quds Committee, under the chairmanship of King Mohammed VI of Morocco, in preserving the identity of Jerusalem and its character as an open city to the followers of all revealed religions. In the final declaration released at the end of their meeting, held Sunday in Algiers, the Foreign Ministers unanimously reaffirmed the need to preserve the identity and the multi-religious character of the holy city of Jerusalem. The ministers “deeply regret the decision of the American administration regarding Jerusalem,” the Declaration stated regarding President Donald Trump’s decision to recognize the Holy city as the capital of Israel and to transfer there the US embassy. In his quality as chairman of the Al quds Committee, an offshoot of the Organization of Islamic cooperation, King Mohammed VI had addressed early December messages to the UN Secretary General Antonio Guterres and to President Trump expressing his “deep concern and that of Arab and Muslim countries” regarding Trump’s decision. The Sovereign had highlighted the significance of the city of Jerusalem, not only to the parties to the conflict, but to the followers of the three monotheistic religions and had warned that “infringement of the internationally recognized legal and historical status of Jerusalem means one runs the risk of hurling the issue into the quagmire of religious and ideological conflict”. 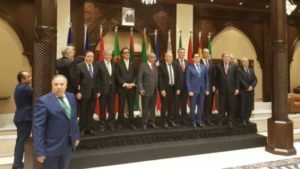 The 14th meeting of Foreign Ministers of the Western Mediterranean Forum, held under the topic: “overall, shared and sustainable socio-economic development”, discussed a set of issues, including economic and social development, youth and employment, migration and sustainable development. As the forum took place amid security and instability concerns in the region, debates focused on a set of regional issues, pertaining mainly to Libya, the Sahel, Syria, Iraq and the Middle East, as well as on the fight against terrorism. In this vein, Moroccan Foreign Minister Nasser Bourita exposed the Moroccan strategy to address security threats, which is based, he said, on an approach encompassing the security dimension, economic growth, human development and the preservation of the cultural dimension. While highlighting the role played by the Kingdom in the promotion of tolerant Islam, Bourita noted that Morocco is establishing itself as a leader in the training of Imams, both in Europe and in Africa. In this connection, the Foreign Ministers of the 5 + 5 Dialogue countries welcomed “all the actions conducted by the Global Counterterrorism Forum (GCTF), which is co-chaired by Morocco and the Netherlands”, according to the Final Declaration. The text added that the participants also expressed concern over the return of foreign fighters after the setbacks suffered by the terrorist ISIS group in Syria, Iraq and Libya. During the Forum, which also discussed the issue of migration, Bourita highlighted the humane policy advocated by King Mohammed VI in the management of migration, with the launch, since 2013, of two regularization campaigns of the situation of migrants in the Kingdom. He underlined in this regard the important role played by Morocco in this area at the African level, as he is the Leader in charge of the migration issue within the African Union. Morocco intends to present at the next AU Summit, at the end of this month, a vision for an African Agenda for Migration, which is the result a wide process of inter-African consultations led by Morocco in recent months, the minister said, recalling that Morocco is to host in December 2018 the first International Conference on the Global Compact for Safe, Orderly and Regular Migration. The Moroccan minister also underlined the Kingdom’s fruitful cooperation on migration issues with several countries of the Western Mediterranean Forum, including Spain and France. In this regards, the Final Declaration emphasized the “importance of the Rabat Process in the management of migration flows”. During the Forum, Bourita officially presented Morocco’s proposal to host a 5 + 5 Ministerial Conference on youth. This conference is aimed at setting up a “Regional Agenda” for the youth with concrete and innovative projects. The 5+5 Dialogue, established in 1990, is made up of Algeria, Libya, Mauritania, Morocco, and Tunisia, from the southern shore and of France, Italy, Malta, Portugal and Spain from the Northern shore. It is the oldest bloc in the Mediterranean region. Written by: Peter Mulvany on January 22, 2018. Posted by Peter Mulvany on Jan 22 2018. Filed under Headlines, World News. You can follow any responses to this entry through the RSS 2.0. Both comments and pings are currently closed.